The Katons arranged an inspection of the premises and fell in love with the design, ambience and attention to detail that made this building ageless and thus very special. It took just 45 minutes for them to shake hands on the deal not to just lease the business but to purchase the building plus all of the furniture and equipment. Then the rush was on to complete their dream home in Sydney already under construction, sell up and move. Richard and Carolyn enrolled Jack at Nowra Christian School and Samantha at Berry Public School. With responsibility for the children accepted by the grandparents, Richard and Carolyn commuted between Sydney and the Shoalhaven for several months. What gave the Katons the strength of character and the confidence to make such a move came from their previous experience. Richard served his apprenticeship at Le Sands Restaurant at Brighton Le Sands then honed his skills at the Sheraton Wentworth in Sydney. Carolyn was firstly a travel consultant then went into corporate events management with Balmain Leagues Club. 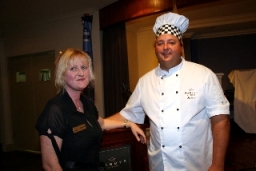 In their first business venture together they managed catering for three years at Kareela Golf Club. Then they opened their own business “Sombreros” a Mexican-style restaurant and steak house at Brighton Le Sands. “Sombreros” operated there for three years before being transferred to Cronulla Beach. After seven years at Cronulla Beach the Katons sold out and took up a catering contract with Westpac Bank. Throughout their 17 years of married life, Carolyn and Richard have worked together seven days a week – that special relationship now being evident in the way they have developed and are now running Gabbys at Berry. Gabbys was winning little business at the time the Katons arrived. Needing other income, Richard secured a job as a building labourer at Nowra during the time he and Carolyn prepared Gabbys for re-launching. From a standing start the Katons catered for 42 events in 2007. With functions already held this year and based on inquiries, a three-fold growth is envisaged for 2008 – and already there are substantial bookings for 2009. By any measurement they have been successful and very happy with their growth. “If you consider our SeaChange…we have definitely made the right decision for our future and our children’s future….and this is very much felt every time we drive back to Sydney….these trips confirm we have made the right move,” Richard and Carolyn explain.